We conducted research last year that showed that young people are likely to base their votes on 'single issues' they are passionate about. Young people attended our Pizza and Politics event, and wrote down over 60 key questions they wanted politicians to answer. Young people filled in our election survey, identifying the top 'single issues' young people were passionate about heading into the election. We used questions written by young people at Pizza and Politics to ask politicians about the issues young people identified in the survey. 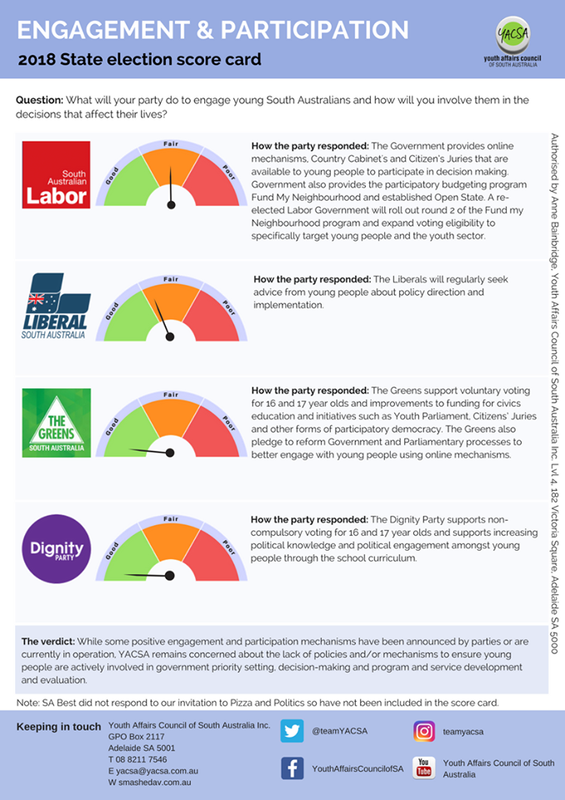 We graded the politicians responses on how well they answered the question, and how their response aligned with YACSA's advocacy and policy platforms. Getting politicians to answer questions from young people, about issues young people are passionate about, based on how young people consume politics. That's how we roll at YACSA.